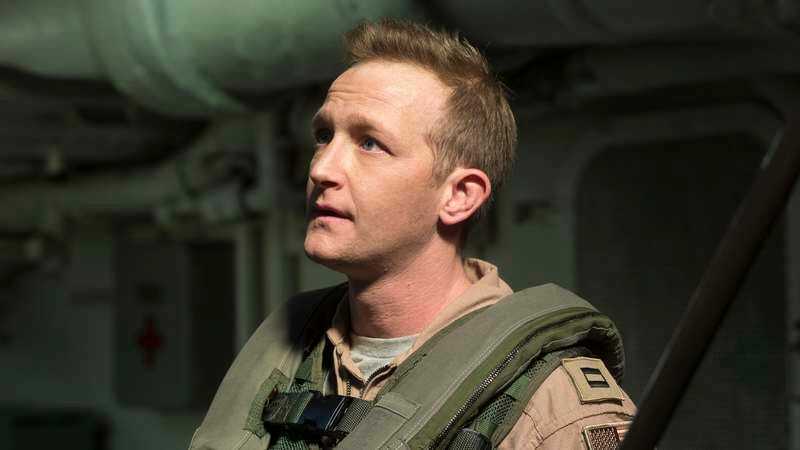 The actor: Eric Ladin has a filmography that discerning TV fans can’t help but admire, having appeared either in one-off or recurring roles on Veronica Mars, Mad Men, Big Love, Justified, Dexter, and Boardwalk Empire, and was also a series regular on HBO’s Generation Kill and AMC’s The Killing. Although his film career got a recent boost through a high-profile role in American Sniper, Ladin is currently back on HBO as part of the ensemble cast of The Brink. Eric Ladin: I can confidently say that I’m having more fun than I’ve had doing anything in a very long time. [Laughs.] I had a blast. Not only because of the people involved and the material, but also the character. I received an audition for a character in the show called Glenn that was going to be a recurring guest star, or he might recur or he might not. They weren’t really sure what they wanted to do with it. And I went in and met Jay Roach, Roberto Benabib, and Kim Benabib, and I took a stab at a character that wasn’t necessarily totally on the page but something that I had in mind that I thought would work. And then I met with Pablo Schreiber and did a little chemistry read with him, and then they basically offered me a series-regular role based on what I’d come in and done. They thought that it was a character who could not just recur but live in their series all the time. So it turned out to be great for me, and I’ve literally been having the time of my life on the show. Pablo and I, I feel like he and I really share a lot of the same qualities in term of work ethic, and we have a really great chemistry. And the writing staff has just been beyond phenomenal in terms of giving me the opportunity to make this guy my own and really explore the depths of this guy Jammer. So I’ve had a big part in helping build this character, as opposed to coming in and having it already been built out for me. So it’s been really great, both creatively and everything else. The A.V. Club: So who is this Jammer guy? EL: Jammer’s a guy who is a phenomenal fighter pilot. He’s a guy who I think maybe wasn’t necessarily the most popular guy in school, but also probably isn’t the smartest guy in the world, but there’s one thing he knows and there’s one thing he’s good at, and that’s flying planes. And he’s found a perfect compatriot in Zeke, his counterpart, played by Pablo. And these two guys together somehow managed to get themselves into trouble but also find their way out of trouble and compromising situations in the most entertaining of ways. AVC: You’ve got a number of military-related projects in your back catalog, but to look at you, you wouldn’t necessarily scream “military man” to the average person. Do you think you owe that to Generation Kill? EL: I owe it to being able to kill somebody with my bare hands. AVC: Well, sure, that helps. EL: [Laughs.] You know, it’s funny. I’m from Texas, I’ve got a little bit of a Southern dialect in my tone, in my voice, and I think I have a look that kind of fills that all-American look: a guy who’s not necessarily the best-looking guy on the block but looks like someone you see in the military, and, I guess, a face that relates to that world. You know, most guys, you think “military” and you think Navy SEALs or recon Marines, both of which I’ve played, and I think a lot of people think that’s a guy who’s got a huge build. But typically those guys aren’t that. They have a body type that’s similar to mine. And they’re mentally tough, and—it probably goes without saying—physically tough as well, but they’re not always the biggest guys in the room. So I don’t know, I guess I just tend to fit the mold, but you’re right, I do play a lot of them since Generation Kill. That was kind of my first big project, and it’s definitely a role that I feel changed my career path. AVC: So how did you get that role? Not that you hadn’t already been a working actor by that point, but as you say, it was definitely a game-changer for your career. EL: Yeah, I’d been in the industry a little bit and guesting on a lot of shows, I’d booked pilots, but none of them went, but I’d never been on a series as a regular. Generation Kill did that for me. It also was my first job with HBO, where I’ve now done six or seven projects. And it came at a time in my life when I think I just needed it the most and it was the most beneficial. I was in my late 20s, and I was working with 32 or 33 other great actors who were all kind of in a similar position as I was, and we spent seven months in Africa doing some amazing work. The experience itself is one that I’m not sure will ever be matched in terms of the life experience that it brought with it. And I got to work six days a week, usually 13 or 14 hours a day, and you become a better actor. Even though you may not know it while you’re doing it, you can’t help but become a better actor when you’re working six-day weeks, 14-hour days, for seven months. And I think that that allowed me to have that opportunity and kind of get back here with the confidence that I needed to take the next step. AVC: Was there a training process before you started filming? EL: There was, yeah. We went to Africa about two weeks earlier, in Namibia, and we trained with some recon Marines who stayed with us as technical advisors, and some acted in the show. We did everything from classroom stuff, learning the vernacular and just the way of life of a recon Marine and what it is that they’re trained to do. And then we got on our feet, and we cleared houses and handled weapons and basically did mock missions, if you will. We had objectives that we had to do, and we actually remained in character, so structurally speaking the guys who played lieutenants acted as lieutenants, and we took the Humvees in the middle of the night and tried to capture a prisoner in a village that they had built, and we had technical advisors played the adversaries who were fighting against us. So in those two weeks, we got a lot of work done, we spoke to each other as we would speak to each other in character, and we had a lot of bonding over those two weeks that I think helped build the chemistry and the world and atmosphere which you see on-screen. AVC: You’d only worked on network series up to that point. When you did Generation Kill, did you have the sensation of, “Oh, my God, so this is what TV can be”? EL: I did. When you work for a company like HBO and you see the detail and the specificity that they put into their projects, the caliber of people across the board that are working on those projects, and the time they spend… so much of it is about them allowing the artist in whatever capacity—whether it be an actor, director, writer, cinematographer, camera operator, or set designer—the time, the opportunity, and the resources they need to make the best product available. And I realized that one that job. You know, we shot seven hour-long episodes over seven months, so when you put that into perspective that we were working six days a week, that’s one month per episode. Now, granted, there was a lot of big stuff that we needed to do, production-wise. But that just doesn’t happen. That’s not something that happens normally in television. So it opened my eyes to it, and it made me want more of it, and it’s what drawn me to work for them as much as I possibly can, because I know their model is something that I am drawn to. It’s the TV I’m drawn to. AVC: If IMDB can be trusted, it looks like your first on-camera role—excluding commercials—was on an episode of Boston Public. EL: [Laughs.] That’s it! Right there! Man, I was so excited for that day. They came to USC. I was a student, and I had gotten my Screen Actors Guild card because I had started to do commercials at the time. But they did a cattle call, an open casting call, at USC because they needed high schools kids, so they were starting to look at colleges in the area to try and get kids. So I went and I read, and then I got a callback, which meant that I had to drive to Manhattan Beach to David E. Kelley Studios and read for producers, which at the time was—I mean, I had two lines, and I must’ve said them five trillion times on my way over there. But I got there and I said them and I left, and it was just so invigorating… and then I got the job! I remember calling my mom and my dad and telling them, and I had made it! Really, truly, I had made it! This was it! And I did the job, I had a blast, and then fast-forward to a few months later, and… it was cut! [Laughs.] The lines were just not even there. So it was a sad process, but it was a great process, because in one job it taught me how exciting it could be and also how heartbreaking it can be in this industry. But I was assured by a director who I happened to be family friends with and who knew the showrunner and had gotten the tape so I at least had it for my reel, that it was for time and not for performance. But whatever the case, it was not on the air. So it was a quick lesson for me to not get too excited about something until you actually see it. AVC: What’s funny is that, in looking through the cast of that particular episode, it’s also the one episode of Boston Public that Brent Sexton did. EL: You’re kidding! Wow, I didn’t know that. That’s fantastic! You know, Brent Sexton and I also—before The Killing—worked together on the pilot for a NBC series called Surface, in which myself and he and an actor named Jay Ferguson—I played Jay Ferguson’s brother, and he played Jay Ferguson’s best friend, and we all went fishing together in the pilot, and I had an unfortunate event take place: I was eaten by a sea monster. [Laughs.] And that kicked off that crazy intense series about a sea monster, much like the Loch Ness monster, except in Louisiana. So, yeah, I worked with Brett Sexton there, too. Wow, that’s funny, though: I had no idea that he was involved in that episode of Boston Public. AVC: IMDB lists you as being in four episodes of Surface, but you’re technically uncredited in three of them, which make sense if you got eaten in the pilot. Is it listed like that because they continued to show the clip of you being eaten in the “previously on Surface” montage? EL: No, you know, what happened is… [Starts to laugh.] It’s really funny, because when you start out in Hollywood, there’s kind of an ongoing joke among old actors when they hear young actors say, “I got this job, and it’s amazing, and I die at the end, but the producers were really nice, and they said I might come back in flashbacks!” When you’re a young actor, you get so excited about the idea of coming back in flashbacks, which—as we all know—never happens. Except in this instance, when it did! AVC: It’s weird, because the credit is on IMDB. It’s just that next to the credit it says “uncredited.” So you may not be credited on the episode, but someone knew you were in it, so they listed you on IMDB anyway. EL: Dude, that was really fun. And what’s funny is that I happened to go through a photo album the other day, and I saw a photo from Cursed: it was myself, Jesse Eisenberg, and Milo Ventimiglia, guys I worked with on that job and haven’t seen in forever but are doing great. It was just kind of a thing where you look at it and you go, “Wow, I’ve been doing this for awhile.” You kind of forget. Cursed was great. I modeled Louie after a character in one of my favorite movies: one of the Cobra Kais in The Karate Kid. [Laughs.] Because he was this clichéd henchman to Milo’s character. Milo played the lead bully, and I was just always behind him, wearing an instigating smirk. And when we get to the wrestling match, like the Cobra Kais and their karate match, I wrestle Jesse Eisenberg, and he starts to gain his werewolf powers while he wrestles me, beats me, and tosses me across the gym? I feel like that’s how it went. But, yeah, it was fun. And it was my first big movie, and it was Wes Craven, obviously a maven in the horror genre, so it was very cool to work with him early in my career. And Cursed makes me laugh. It’s funny. AVC: So were you at all involved in the infamous restructuring of the film? Because the only person I’ve talked to from the cast is Scott Baio, and he just seemed completely confused as to what had gone on with that film. EL: Yeah, all I know is that about a year after I shot the movie, I got a call saying that they were going to reshoot something and “you’re gonna need to come back.” And I’d just shaved my head for another part, so I’m like, “I don’t have hair!” And they said, “We’ll put a wig on you.” It was just so weird. Nobody really knew what was happening, and then you go to the premiere, and I honestly never even knew what was reshot, what was rewritten. I have no idea. I think in the end, after everything was said and done, it turned into an $80 million or $90 million movie that was supposed to only be about $40 million. It was bad. EL: Yeah, so, there you go. I really do believe that was the case. I have no idea what those numbers were, obviously. That’s way out of my pay grade. But that sounds about right. AVC: Now, you mentioned that Cursed was your first big movie. Again, this is based on IMDB, but does that mean that you don’t rate Toolbox Murders as a “big movie”? EL: You know what? I was actually shooting those at the same time, which was really interesting. But, yeah, Toolbox Murders wasn’t as big of a budget a movie. You know, looking back, it’s so interesting, because I shot these two horror films essentially at the same time—I don’t remember the timeline exactly, it’s been a little bit—but you’re working with Tobe Hooper, who directed Toolbox Murders and who’s iconic in that world, and you’re then working with Wes Craven, who’s also iconic in that world, doing this huge budget movie. I so vividly remember walking after working on Cursed, and how budget of a budget it was, with craft services, and we shut down Hollywood Boulevard and shot at Madame Tussauds Wax Museum, and the effects that they had with cables and pyrotechnics and yadda yadda yadda. And then I remember walking on set to Toolbox Murders, and this budget was next to nothing, and they had this catheter that they were putting in this face mask, and they were just going to physically be under the camera with a little pump, pumping blood out of the nose or neck of somebody. It was literally like a student film versus a Hollywood blockbuster, but it was really interesting because I’d never worked in those two realms to see the differences so close together. Craft services was a folding table with some Nilla Wafers versus an omelet bar. [Laughs.] So I was quickly learning the differences in budgets, where the money goes, and how it’s spent. I waited for 45 minutes or an hour, and then of course I went in and met Matt Weiner and had a great time with him, and I ended up getting the show. And I thank my stars that I didn’t become an idiot and walk out because it was taking too long and I was too hot in my wool suit. [Laughs.] But it was such a fun role. I mean, to be able to be part of a show that I consider one of the most influential television shows in the history of television… I really feel that Mad Men broke the mold and paved the way for cable television drama. And where we are right now, in what people like to consider the golden age of TV, I look back and point to Mad Men at AMC. AMC, who was known for playing old movies, decided to take a leap and go into scripted television. And now, however many years later, we’ve got all these cable networks who are doing the same thing. And it’s because of Mad Men! They took a chance and let them tell this story in a way that never would’ve lasted on network television, and they did it beautifully, and they did it people who weren’t stars, with actors who were great talents. It’s really phenomenal. I’m thrilled that I was able to play a part in it, and William was a lofty little punk. But I had a great time with Jon, a great time with January, and with Matt Weiner. My only wish is that I wish I would’ve gotten to do more, because I love that period. I loved wearing the clothes, I loved everything about it. AVC: I’m not going to tell you that I necessarily see a sibling resemblance between you and January Jones. EL: [Mock huffiness.] So I’m not as beautiful as January Jones? Is that what you’re saying? AVC: I’m just saying that the resemblance eludes me. EL: Just the creepiest doctor there ever was. [Laughs.] But really a ton of fun. And I don’t mean to sound repetitive here, but I really do feel so lucky to have worked on the shows that I’ve gotten to work on and play the characters that I’ve gotten to play. So when I say this stands out as one of my favorites, I really, truly mean it, even though it sounds like I’m saying it about every role. But Big Love was great. Working with Chloë [Sevigny] was great, and to play a doctor as creepy and lascivious as Roquet but not play it on the nose was really a fun thing for me to do. I remember one story that kind of stands out to me, and that’s when I had a scene in which I had just loads and loads and loads of medical jargon and terms that I had to remember. While I was doing it, I was putting on my rubber gloves and grabbing a needle and administering a shot to Chloë’s upper thigh. But the key was that when I drew the fluid from the little vial, it was a real needle and a real syringe, but then I had to set it on a table and make sure I picked up the stage fake needle to puncture her thigh with. And I was so nervous that I was going to pick up the wrong needle, all the while trying to say this dialogue. I think we did 25 takes, because I couldn’t get it right. I kept messing up the words. I’ve never felt as nervous on a job as I did on that one scene on that one day, where I just couldn’t get it right. And I remember Chloe was so nice, and she was, like, “Take your time. Don’t worry. If you stick me, you stick me. It’s no big deal.” I’m, like, “Yeah, but my hand is literally on the top of your thigh with a real needle.” [Laughs.] And I’m trying to say the jargon and all the while trying to act at least somewhat decent. So I always remember that story, and whenever I see guest actors or somebody who’s in a similar situation, I always try to go out of my way to make them feel comfortable, because I’ve been there. AVC: Did the AMC connection from your stint on Mad Men have anything to do with you getting into the mix for The Killing? EL: You know, I don’t think it can hurt. People have asked me that before, and if the network knows you and they like your work and they know your work ethic, I’d like to think it played a part and it helped. But it was a completely different production team. I think that, more than that, the casting played a part, because at the time I was about to sign on to do another show that I had an offer for, and my manager sent me the script for The Killing, I just said, “I’ve got to do this show! I love it, I love it, I love it!” And I was the first person to read. Like, they weren’t even reading my character yet. I was literally the first human to read for the show, because I had to see if I could get in there and read and get an offer before I signed on to do this other show. And they called, and they said, “Well, yeah, we love him, but we’re not planning on casting that role yet.” It was that early in the process. So I really attribute it a lot to the casting directors, because they were the ones who reached out to me and said, “I think you’re right for this role. Read the script, tell us what you think, and if you do like it, get in here ASAP before you sign on to do another show if you really think this is right for you.” So I think it was predominantly them, but I sure don’t think my relationship with AMC hurt. But, yeah, I loved it. That was a great experience for me. AVC: So were you shocked when everyone threw a conniption fit about the lack of closure at the end of season one? I do think that there were things that AMC could’ve handled differently publicity-wise to not mislead people and not make people think that they were going to find out. But at the same time, I watch Homeland and all of these other shows that leave you hanging, and people don’t freak out about those. So I still maintain that they did the right thing by not revealing it. I think one of the things that they could’ve done in hindsight—which, of course, is 20/20—is that they could’ve called it season 1A and season 1B, or they could’ve just said, “This is still season one, we’re just taking a hiatus, and then we’re going to pick back up.” Then it wouldn’t have been a big deal. But because it was the season finale, people just couldn’t handle it. But I also think it was at a time when these serialized shows were still relatively new for current audiences. Now there’s a lot of shows like that, but at the time, The Killing was really and truly one of a kind, so people were still used to having things wrapped up in a bow. Okay, maybe not at the end of every episode, like on a typical procedural, but surely at the end of the season. And they weren’t ready to say, “Well, we’ll just go on this ride for another season, and we’ll pick it up again in six months!” They weren’t ready for that. But, I mean, Game Of Thrones, for God’s sake, they don’t give you anything! [Laughs.] Yeah, they usually kill somebody in the penultimate episode, but other than that, they’re not wrapping everything up in a bow! AVC: Did you have a favorite Jamie plotline? EL: I loved the second season. I loved all the stuff that got to happen in season two and, obviously, the final couple of episodes, when at the time I knew—but no other actors or crew people knew—that I was involved. Oh, sorry: spoiler alert if you haven’t watched it! [Laughs.] But, yeah, those last three episodes were really, really fun and really challenging. And Patty Jenkins, who had shot the pilot, which I think is one of the best pilots ever made, came back and shot that season finale. I love working with her. She’s such an actor’s director and really took the time to map out the arc of how we were going to do it. That’d probably stand out as one of the most fun parts. AVC: So how did you feel about Jamie’s ultimate fate? EL: I felt it was fitting. You know, I felt that it explained a lot about him, and what you came to realize was that Jamie wasn’t an evil person, but there are times when… I think he looked at Darren Richmond as somebody he would literally do anything for, and he would do anything to keep his job and maintain his job and try to get Richmond elected. And he didn’t mean to kill her—and I guess he didn’t, technically—but he got so wrapped up in the moment that he lost himself and did something that he’d probably regret forever… or would’ve, if he hadn’t died. [Laughs.] But that was that. AVC: Well, let’s just presume that he at least regretted it right up until that point. EL: Well, he essentially committed suicide, so it wasn’t as if he didn’t know that what he did was wrong. By grabbing the gun and pointing it, he knew he was going to get shot and killed, so I think that says a lot about who he was. EL: Yeah, man! You know, Justified is such a cool show, so when that came along and that offer came through, I just said, “Yeah!” Again, it was a case where just having the opportunity to work on the show was so cool, but working with the people I worked with on the show was great, too. I got to play a meth head, which I hadn’t gotten to do before, and I got to wield guns, which I do often, as you know. [Laughs.] But I got to do it in a way where I wasn’t playing military. I was playing a meth head, so it was someone who didn’t really know how to use a gun but had a gun anyway, and he was tweaking out a little bit, so it was awesome, man. You know, something I’m really anxious about—and I actually just talked to my team about this—is that I’d really love to do a Western. So doing something that’s even leaning into that world, that’s good by me. AVC: You’ve obviously done a number of one-off episodes, but I’d be remiss if I didn’t ask you about the fact that you’re in the final episode of Dexter. AVC: Had you been a fan of the series? EL: I had. I’d been a fan of the series, and I’d watched probably the first four seasons, maybe through the fifth season. Up through the John Lithgow season, but I can’t remember which one that was. But because of work and being out of the country, life kind of took over, so I’d missed out on a couple of seasons, but I really loved the show. It was one of my favorites. I was in New York doing Boardwalk Empire at the time, and they called me and said, “Hey, we’ve got a part on Dexter, and it’s on the series finale. We can’t tell you anything about it, but we’re not auditioning, we’d just love for you to play a part. Will you do it?” I was, like, “Um, can you at least tell me a little bit about it?” [Laughs.] And they said, “Welllllll, we can tell you that you’re going to play a veterinarian. And you’re going to lose your tongue.” And, of course, I said, “Well, that sounds too fun to say ‘no’ to.” I mean, I get to lose my tongue? That’s cool, right? So I said, “Yes,” and it was great. It was loads of fun. I would’ve loved to have worked with Michael [C. Hall], but I’m sure that opportunity will come some other time. But to be a part of that show, even for just a split second or a cup of coffee, as they say, was really cool. AVC: Did you get to keep your tongue? EL: I didn’t! I never even got a prosthetic tongue for them to cut out. It was kind a bummer. All I got was a mouth full of blood. AVC: Ah, well. You get what you get. EL: [Laughs.] Exactly. But it was good: I went from playing J. Edgar Hoover in New York to get my tongue cut off. AVC: In playing Hoover, did you feel obliged to study up on him, or did you just stick to the portrayal as written in the script? EL: No, I studied a lot. That was one of the most scary jobs I’d taken, just because I knew how he’s such an iconic figure, and people know so much about him and have these ideas of him, and on a show like Boardwalk, where you know it’s going to be written well and done properly. I was extremely nervous. So I did a lot of research on him and his early life, and also his later life, but I kind of focused mostly on the time period I was playing, as well as his childhood and what got him to the point where he was at the time where I was going to play him. And then I had a dialect coach to help me in that regard, and I guess my theory or process when you play somebody like that is that you have to research, research, research, and then once you start going, you’ve just got to have the confidence and trust that the work is going to be there, and that’s it going to be good enough, and then you kind of let go of it. I mean, I didn’t want to impersonate J. Edgar Hoover. It was just kind of my take on him at that time. But it was really one of… [Starts to laugh.] Here I go again! But it really was one of my favorite jobs, because it was so challenging. The dialogue was challenging. But to get to have the scenes that I had with the actors that I got to work with, like Brian Geraghty, was great. The creators of that show, Terence Winter and Howard Korder, all of those guys are so good, and they’re so giving, and they allow so much time. Again, HBO, you can have as much time as you want on that show to make sure that you’re happy with your work. So it was phenomenal. Absolutely phenomenal. EL: [Laughs.] I mean, best day ever, right? So I had a lot of fun doing that. That’s really about all I took away from it, but I’m not sure that I needed to take any more from it. That’s about as good as it gets! EL: I had auditioned for another role, and Clint [Eastwood] had responded, but he responded to say that he thought I’d be well suited for this role. I loved it, man. I mean, it’s an opportunity to work with Clint Eastwood! Even though it seems like those might be numbered now because of its age, he’s as spry as can be, so who knows? Maybe they’re not as numbered as they seem. But to work with an icon like him, that’s just something that you can’t turn down. You can’t do it. And to work with Bradley [Cooper], who—I’m not sure there’s an actor right now who’s more on top of his game than Bradley, and he’s as professional as they come. He was so wonderful to work with, and he’s somebody who I have a relationship with now. He’s really a phenomenal, phenomenal dude. So those two guys alone made the process worthwhile. So I had a good time, and I got to play a Navy SEAL. I’ve obviously done similar roles, but never a Navy SEAL, so that was a lot of fun. I just had a good time. The time in Morocco was fun, and I met some cool guys along the way. But I think what I’ll take most from it is working with Clint and working with Bradley, and hopefully I’ll get a chance to work with both of them again soon. AVC: Meanwhile, what I’m taking from this is that you’ve played guys named Gopher and Squirrel… and, better yet, I just asked you about them back to back by complete coincidence. EL: [Bursts out laughing.] What does that even mean? What’s next for me? Playing a guy named Beaver? I don’t know which one of them is my spirit animal. Maybe if we could put them together. If we could have a Navy SEAL that was ripping bongs in a robe and a Speedo, then that’s my guy.